Entertainment Tablet. Is the iPad the heralded revolution? 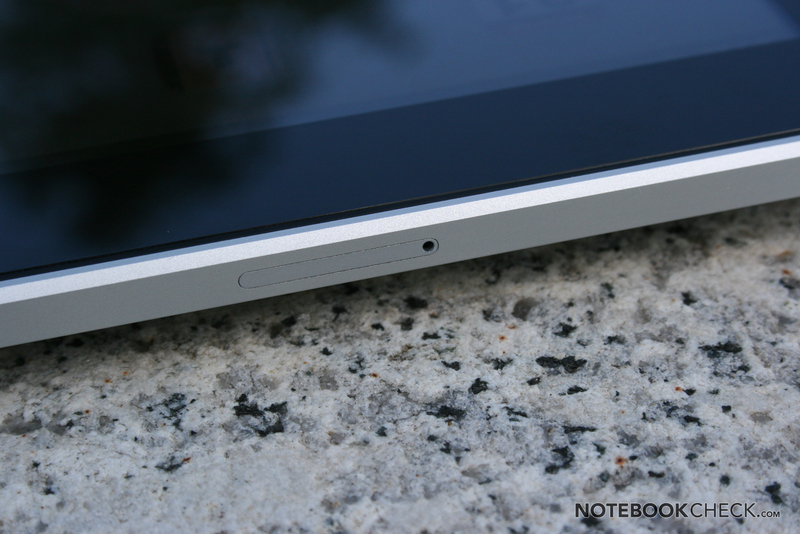 Can it replace a notebook or a netbook? 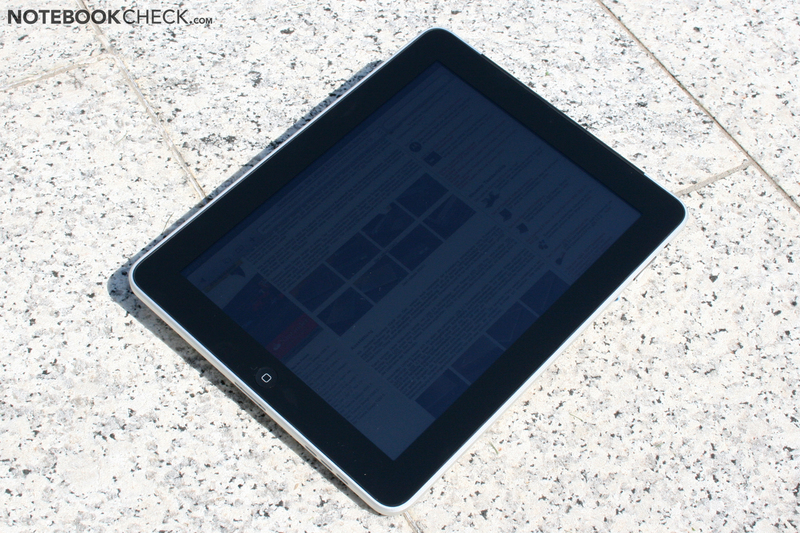 We have dealt extensively with Apple's tablet over several weeks in our long-term test. 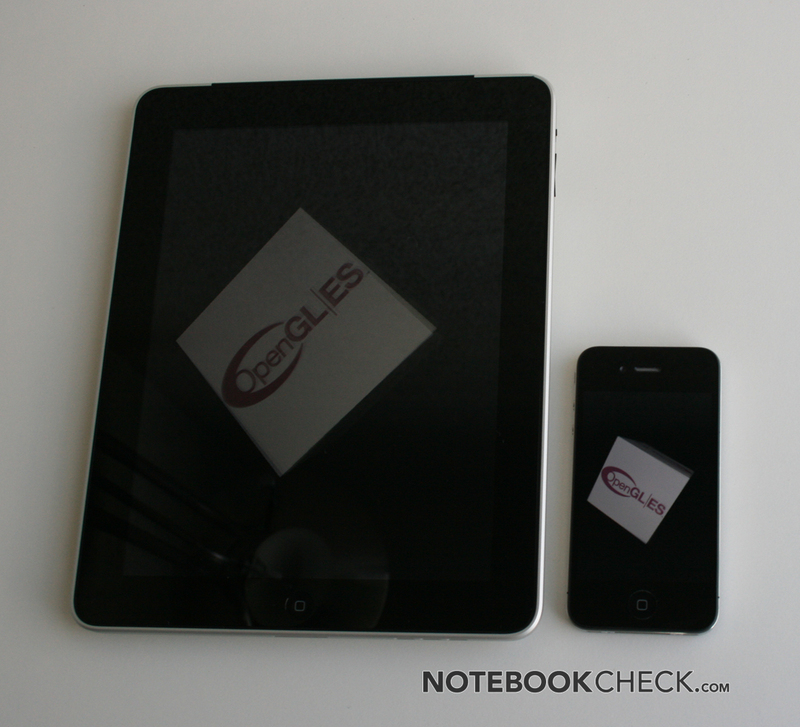 Apple sells the iPad in two different alternatives, one with and the other without a UMTS/GPS combination. Additionally, the user can choose among a memory capacity of 16, 32 and 64 GBs. Apple sent us the top model with a 64 GB memory and UMTS modem (equipped with a micro SIM from Drei, an Austrian mobile provider) for the test. 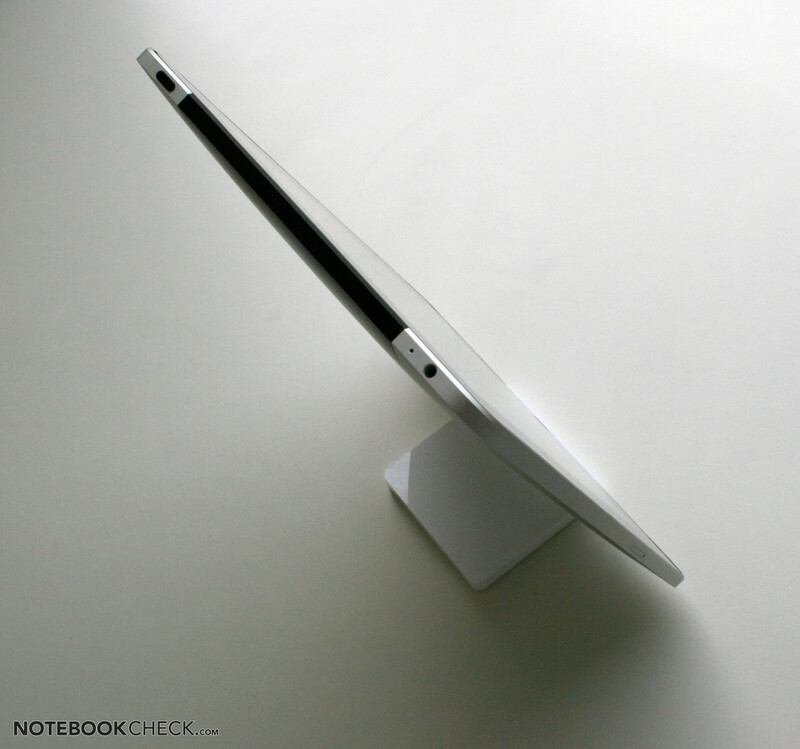 The Apple iPad gleams with its plain, minimalistic design. Rounded edges, beveled sloping edges and the colors black and white dominate its looks. Alone the numerous imitators in China prove that the appearance is very successful. The size and weight may be considerably lower in comparison to most netbooks, but it can't provide the mobility and the never-be-without-it factor of a smartphone. The 730 grams that the 3G model weighs can prove to be heavy enough after a longer use with one hand. 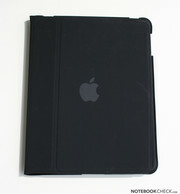 The high-end materials of the iPad are immaculately processed and have an exact fit. The aluminum bottom tray makes a high quality and solid impression. Even the glass plate in front of the display looks elegant and robust. Accordingly, the iPad can't be significantly dented or twisted anywhere. Fingerprints on the screen can be removed quite easily due to an anti-grease coating. They are particularly striking on the glass plate in bright surroundings. 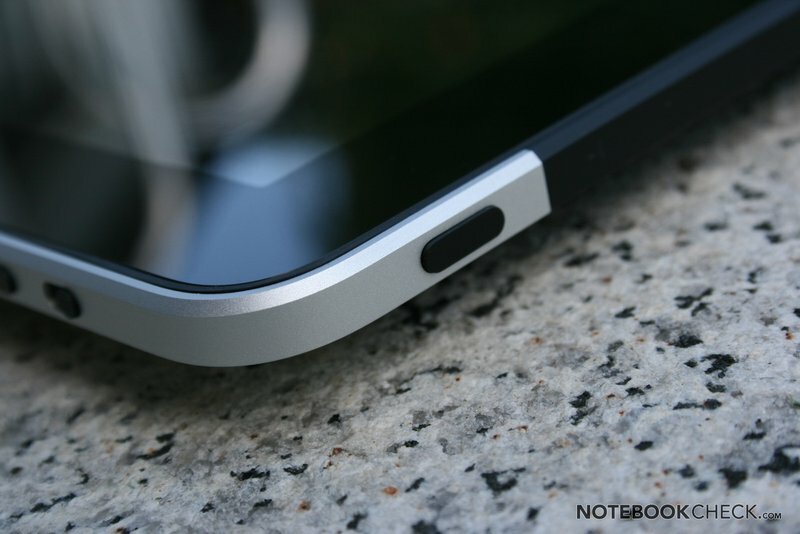 In return, the aluminum bottom is practically immune to visible marks. 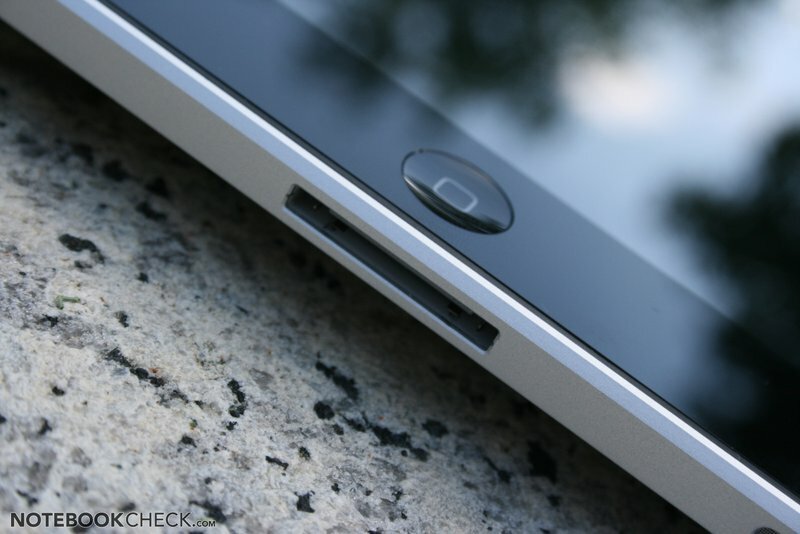 Apple only offers the known docking interface from the iPod and iPhone for wired connections. 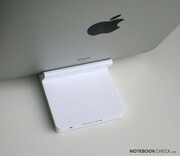 The iPad can be charged over it and numerous peripherals can also be connected. A (keyboard) dock, camera interface (USB and SD cardreader) loudspeaker systems and VGA dock (1024x768) are optionally available, for example. Dedicated USB ports (e.g. for external memory media) or an integrated cardreader (for memory expansion) is looked for in vain, though. 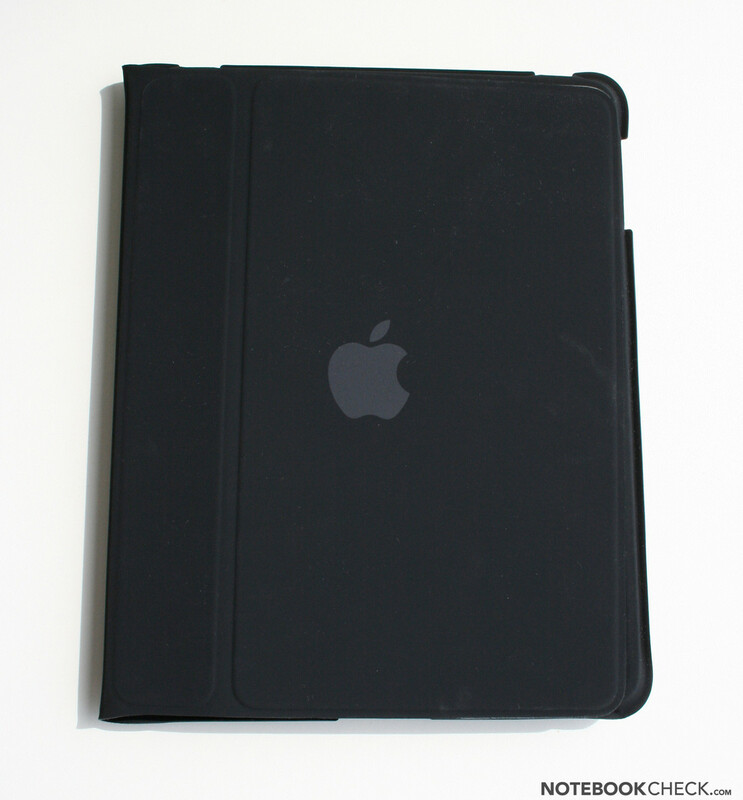 Furthermore, the iPad's case hasn't been made to be opened by the user (see iFixit teardown). Thus, the implanted battery can't be exchanged without further ado. The 3G version we tested also had a micro SIM card slot on its left. The wireless technologies comply with the latest technical standard. Aside from abgn WLAN, you'll also find Bluetooth 2.1+EDR. The currently used iOS operating system version can't be used by all Bluetooth profiles, though. You'll additionally find a UMTS modem in the 3G version (only for data connections), which supports UMTS/HSDPA (850, 1900, 2100 MHz) and GSM/EDGE (850, 900, 1800, 1900 MHz). Besides that, you'll find an accelerometer (for recognizing movements) and a brightness sensor for automatic determining the perfect background light on the configuration list. Regrettably, it wasn't working in our test device and therefore we couldn't rate it. 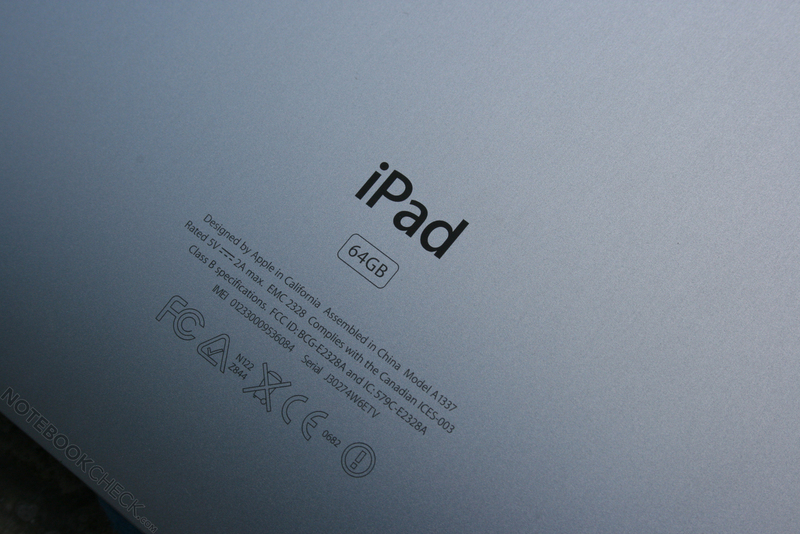 The iPad's excellent capacitive touchscreen will clearly be the main input option. It supports multi-touch and responds precisely to finger inputs. We couldn't observe a deviation in calibration along the edges, either. Especially scrolling and swiping works superbly on the iPad and clearly contributes to the very good overall impression. The hotkeys (power, home, volume rocker, rotation lock) make a high-end impression and are cleanly fitted into the case. The virtual keyboard is pleasant to use due to its feasible size, especially in the horizontal format. We, however, miss arrow keys for navigating comfortably through texts. The on-screen keyboard isn't suitable for typing longer texts (large amounts of this test were written on the virtual keyboard and led to the corresponding fatigue). 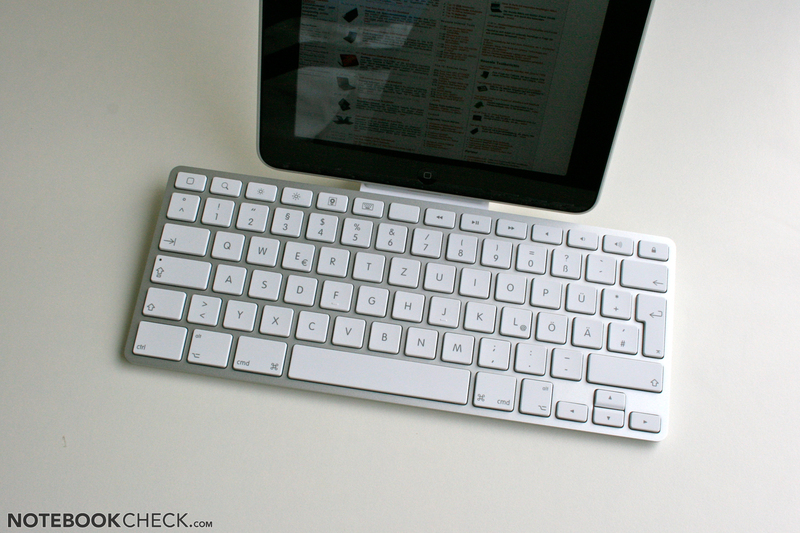 The keyboard dock, which we also tested, has an Apple-typical single key keyboard with a slightly modified layout. It's made of a non-twisting aluminum plate and bids a pleasant stroke. As usual, the enter key has turned out a bit too small. 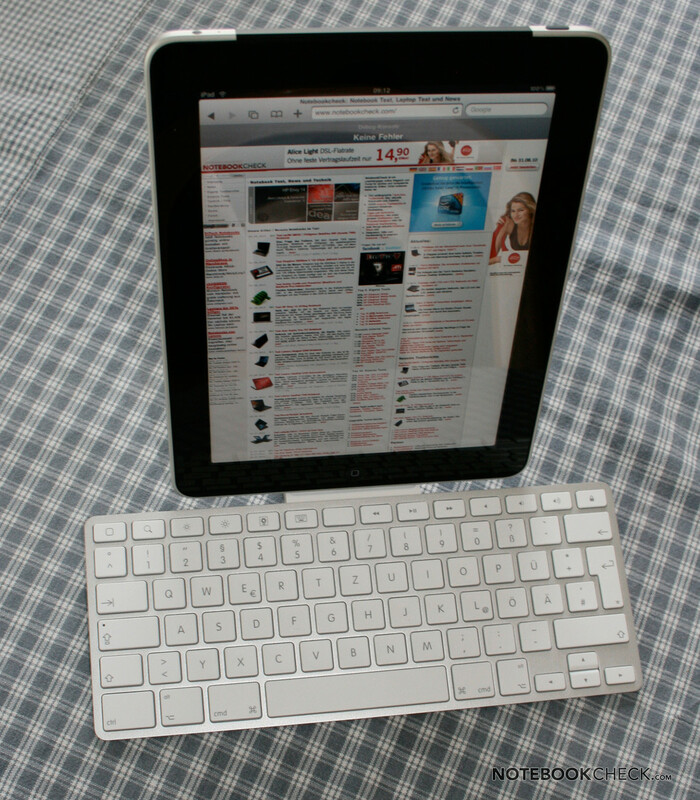 Nevertheless, the keyboard proved to be excellent for longer texts in the test and can turn the iPad into a typewriter. 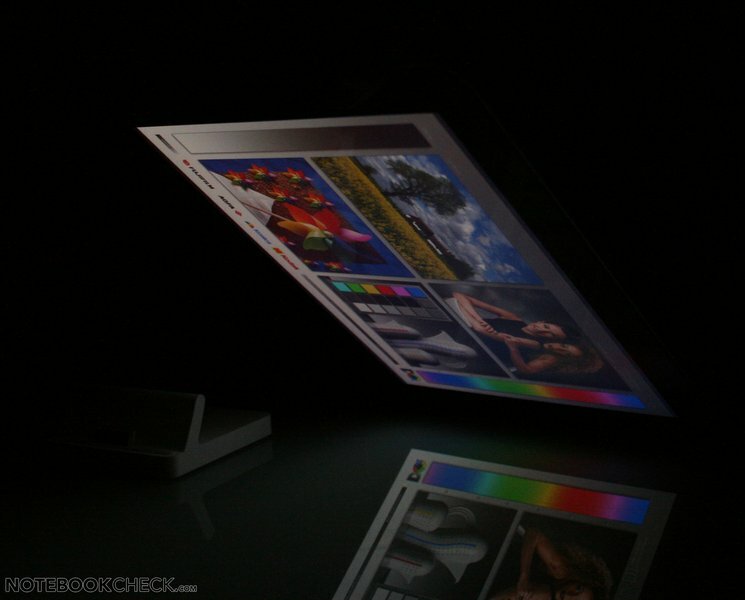 The main focus of a tablet PC is definitely its display. Apple has spared no expense and has installed, as already in the iPhone 4, an IPS display with a nowadays unusual resolution of 1024x786. 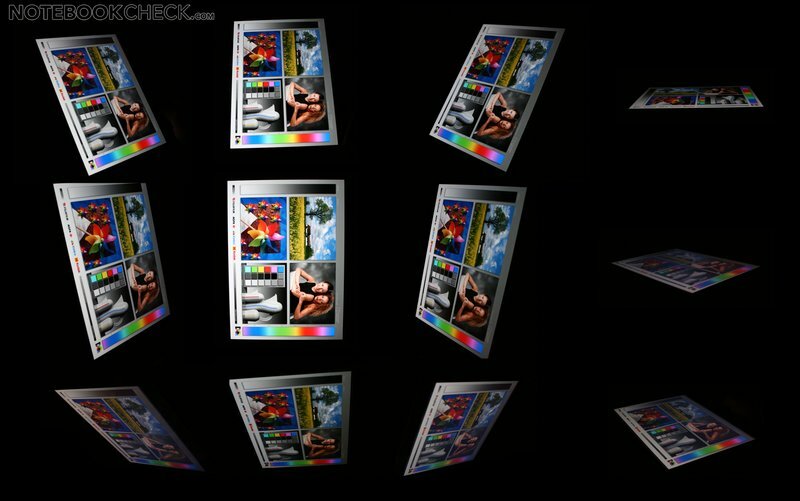 The 9.7 inch LED widescreen display has a good average brightness of 287 cd/m2 and an outstanding illumination of 90%. 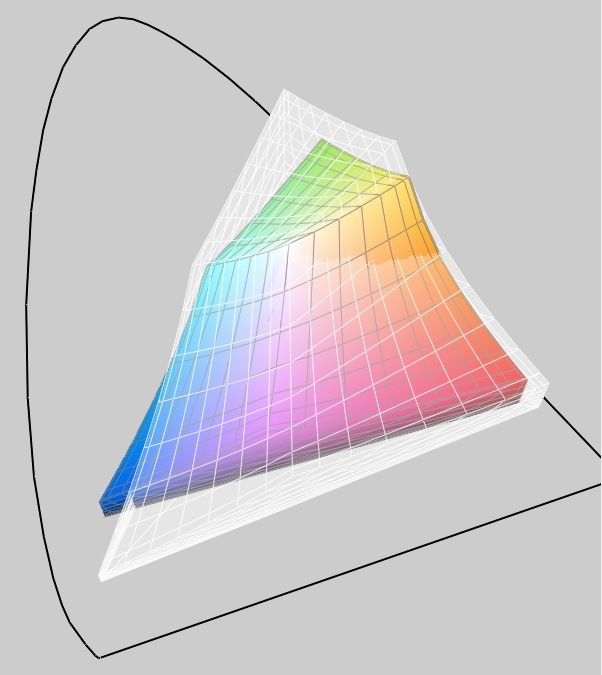 Even the contrast of 778:1 of our test device is impressive and renders "crisp colors". The IPS display's representable color space is not especially large according to our assessment with iOne Display 2. 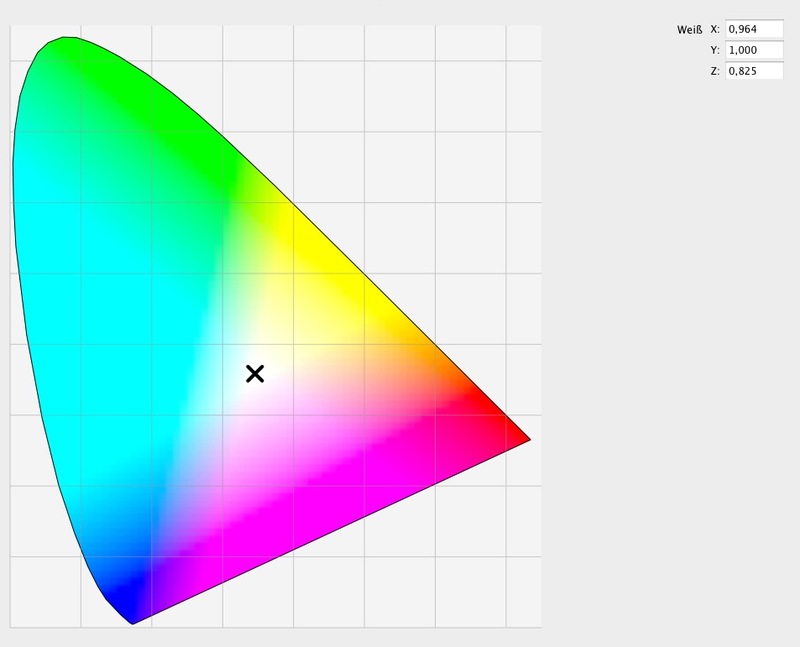 It remains well below the RGB color space and is thus comparable with that of the latest 2010 MacBook. This is nevertheless fully sufficient for most application fields and doesn't prove restrictive while viewing pictures in the test, either. 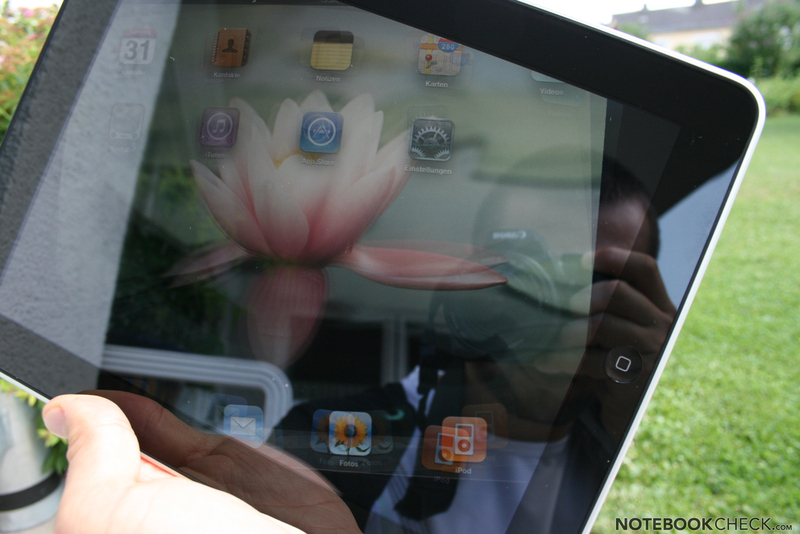 The intensive reflections of the glass plate mounted in front of the IPS display are particularly disturbing outdoors. The brightness unfortunately isn't strong enough to outshine reflections in sunlight. In comparison, the new iPhone 4 display is also considerably brighter. 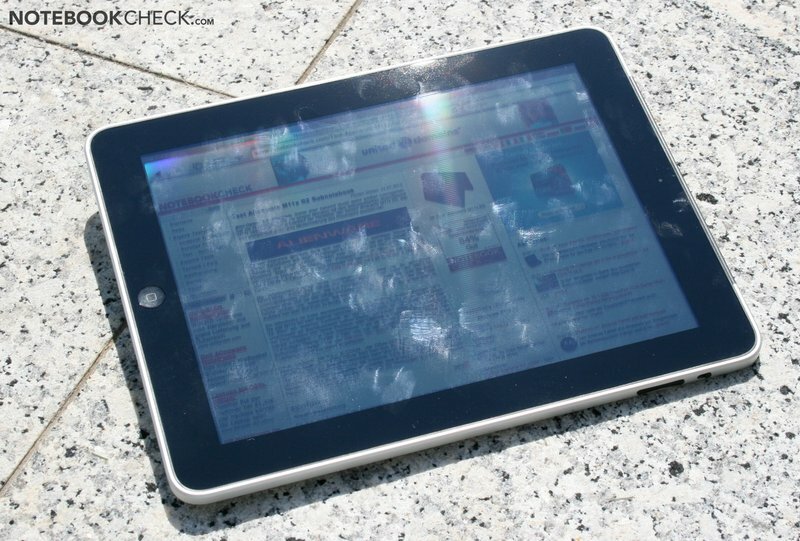 The iPad is, however, well usable in the shade, although you still have to struggle with reflections. Thus, a use in glaring sun is already excluded by the display, and even overheating problems due to strong solar radiation have been recorded. Due to the used viewing angle-stable IPS screen, the tablet can practically be used in every angle without disturbing color falsifications turning up. The glass plate's reflections limit the viewing angles much sooner. 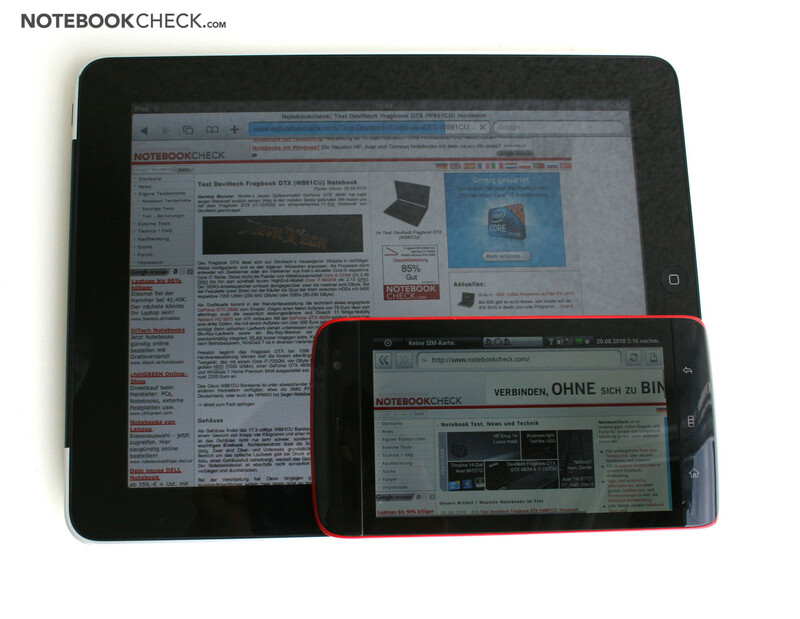 In comparison to the TN screens currently used in almost every laptop, the difference is clearly visible. It is rumored that the Apple A4 processor, clocked with 1 GHz, is based on a Coretex A8 core and thus only has a fraction of the computing performance of current notebook processor standard. 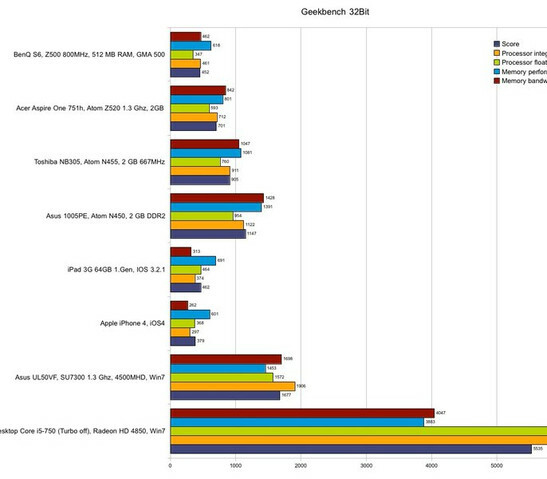 Even weak Atom processors in netbooks can surpass the A4 clearly. The used A4 in the iPhone should however have a slightly lower clock rate than the iPad A4 because it's slightly weaker in the synthetic benchmarks. Because of the perfect modification of the operating system to the processor's performance, you don't get the impression of too little power. Longer waiting times only have to be accepted every now and again (large websites, PDFs). The A4's processor performance is on par with an Intel Atom Z500 that is clocked with 800 MHz in Geekbench. The 1.6 GHz alternatives that are usually installed in netbooks are, as expected, twice as fast. Slow dual core CULV processors, like the Core 2 Duo SU7300 with 1.3 GHz are even much faster. We also included a current desktop quad core with 2.66 GHz for comparison. According to Geekbench, it provides more than the 10-fold speed. The pre-installed Safari's Java Script performance isn't only dependant on the devices computing performance, but also on the browser's optimization. This becomes especially evident in the UL50VF, where Chrome and Safari are 10 times faster than the old Internet Explorer 8 in Sunspider. In comparison to that, the iPad does quite well and lags only slightly behind. 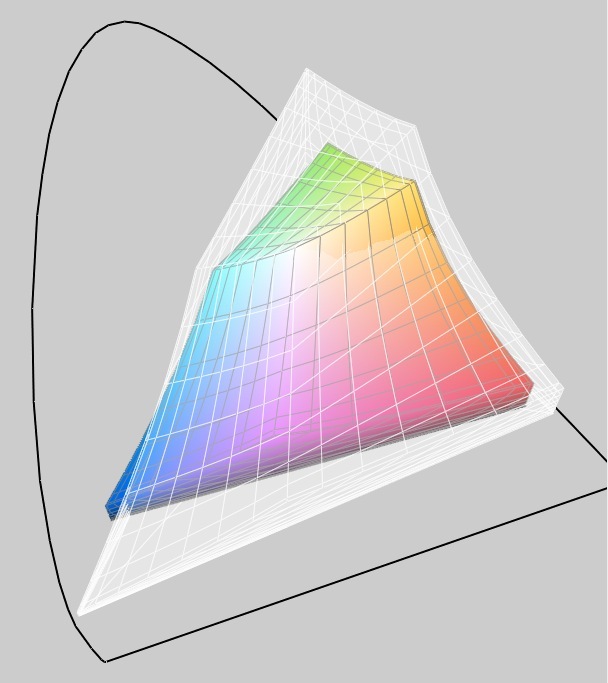 The effects of optimization can also be seen in Android. 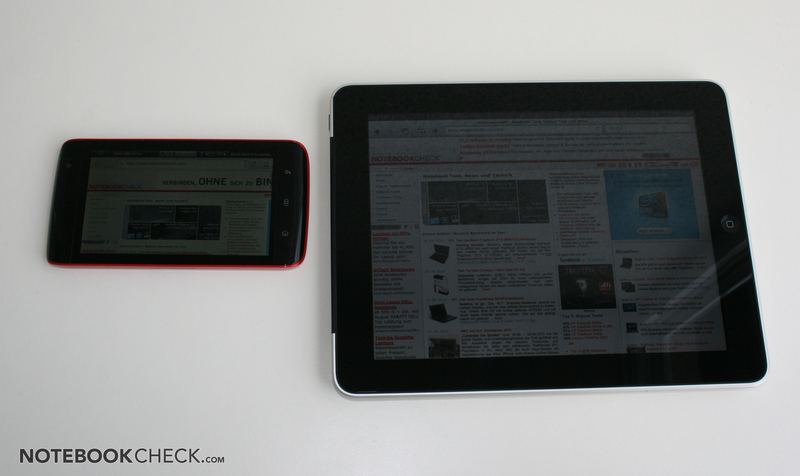 The Dell Streak with Android 1.6 is worlds apart from the Nexus One with Android 2.2, although both rely on a 1 GHz Snapdragon CPU. Generally, well optimized desktop browsers on laptops or desktops are still able to set themselves clearly apart from mobile webkit browsers in Android or IOS. 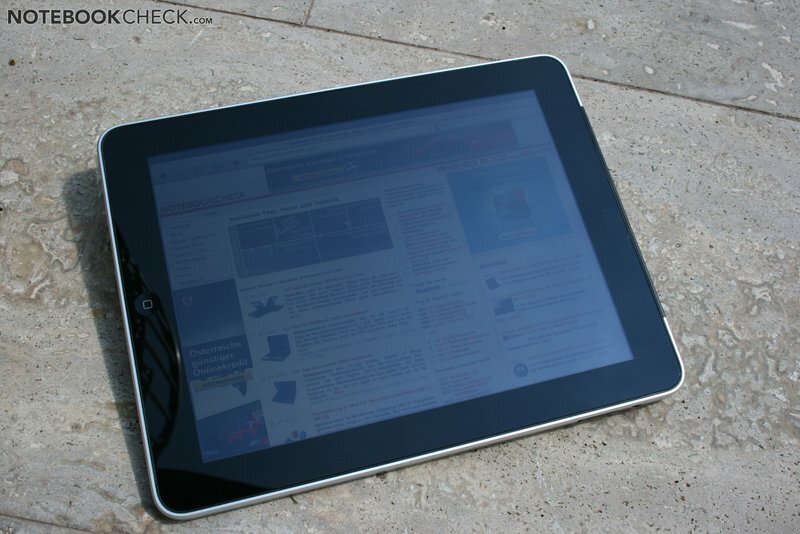 The iPad is nevertheless pleasantly fast in daily browser use. Only very complex sites (for example, Typo3 Backend) overtax the browser visibly and sometimes even lead to Safari crashing. Because of the scrolling smoothness even while the site is loading, long pages even feel smoother than on netbooks or notebooks. 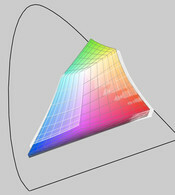 Rumor has it that the integrated graphic core of the Apple A4 is based on a PowerVR 335, which is also used in the Intel GMA 500. Thus, the theoretical 3D performance also only ranges at the end of graphics performance found in notebooks / netbooks. 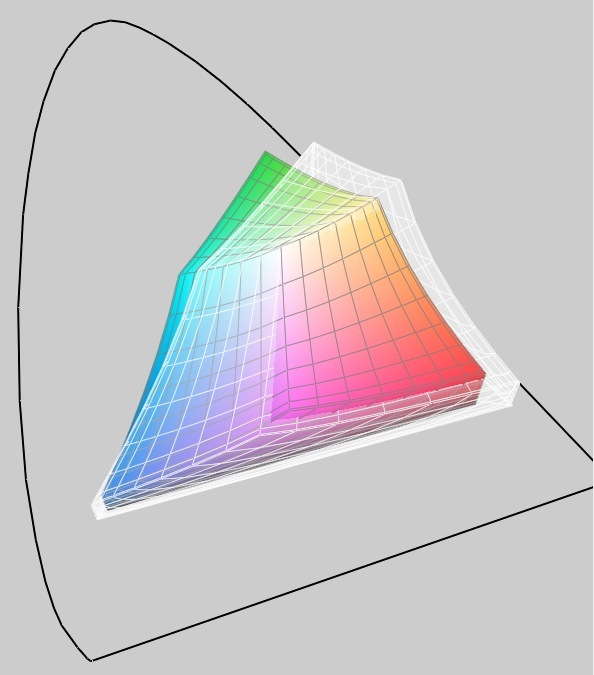 However, a lot more can be made possible than in Windows games that are kept very general (in netbooks with GMA 500) by adapting the games to the graphics core. 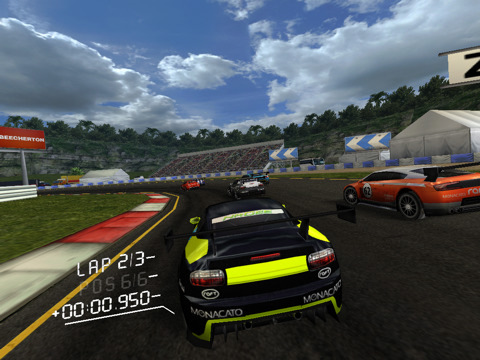 Games like Real Racing HD or Nova HD surprise with fairly good 3D graphics and exploit the hardware very well. 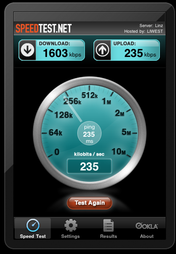 WLAN performance is convincing in the practical test, too. There weren't any interruptions in connection with our Trendnet Draft-n router and almost the full internet speed of 30 Mbit / 1Mbit was achieved (see screenshot). The WLAN range was comparable with average notebooks. UMTS reception was also without flaw in the practical test. 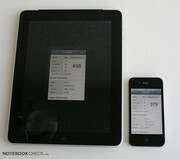 The Drei prepaid card provided by Apple reached a maximum of 2010 / 232 kbps in the test (Linz Airport). Because there aren't any moving parts found in the iPad (neither a fan nor a HDD), the Apple tablet is absolutely silent in every application. The temperature development of our test device was never critical and always stayed under skin temperature. 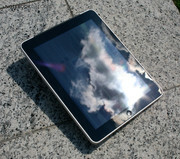 However, if you use the iPad in blazing sunlight, then the case clearly heats up on the outside. It also always remained slightly below skin temperature with an assessed 29-32°C indoors and thus never felt warm. 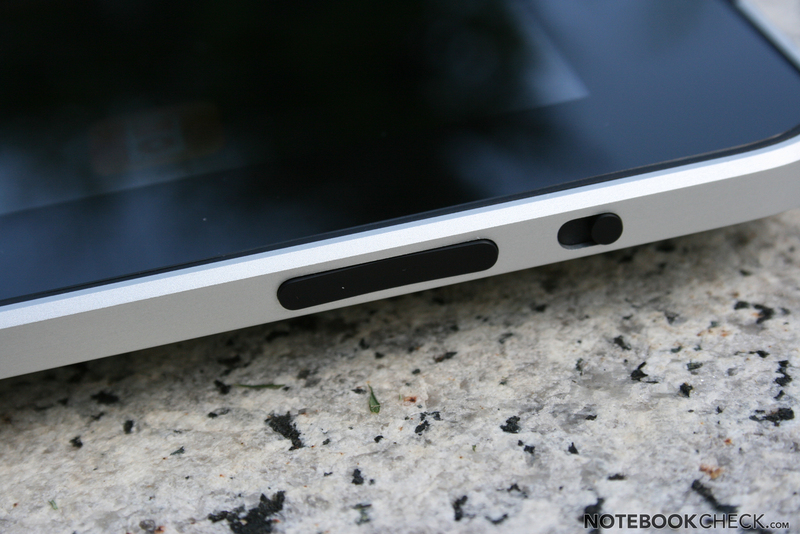 The built-in mono loudspeaker is on the iPad's bottom side. The position doesn't really matter because of the tablet's rotation, but it is often covered unintentionally by the hand. That's why two loudspeakers would sometimes be desirable and might even create a stereo feeling. The quality is good for the small size and suffices for movies and gaming sounds. Even background music via internet radio or the iPod function can satisfy undemanding users. In our opinion, the maximum volume is also sufficient for watching videos with two persons. The built-in audio-out supplies a clean signal without static and in a good quality. Here, it becomes evident that it originates from the iPod series. The integrated microphone works perfectly with Skype in the test. Video conferences aren't possible due to the lack of a webcam, though. Apple heralds the iPad to have a surf time of 10h, respectively 9h (via 3G). This rate is confirmed in our practical test when the display brightness isn't turned up to the full. For example, we achieved 9.5h with a WLAN connection with brightness set to medium. The time increases to an impressive 14 hours and 13 minutes with minimum brightness. This shows clearly that the LED display is the biggest energy consumer. The iPad ran for a maximum of almost 17.5h (idle, minimum brightness, WLAN and 3G disabled). The iPad ran a minimum of 4.5 hours (maximum brightness, 3D game, WLAN and 3G enabled). 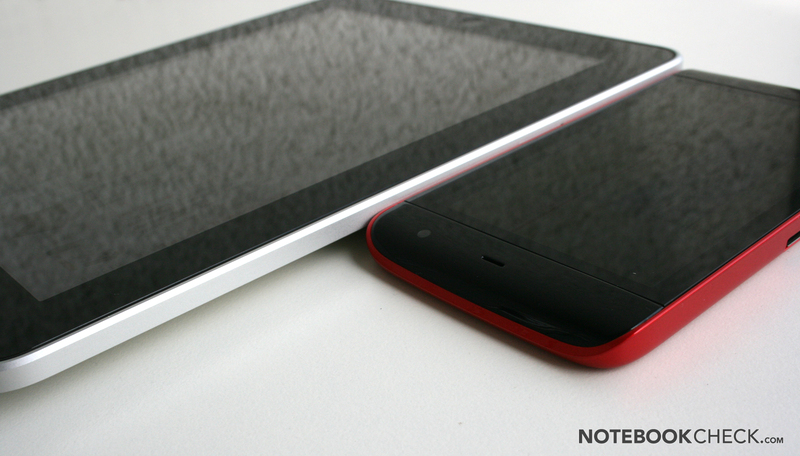 Thus, you can count with a total of 5-10h of battery life in normal use. 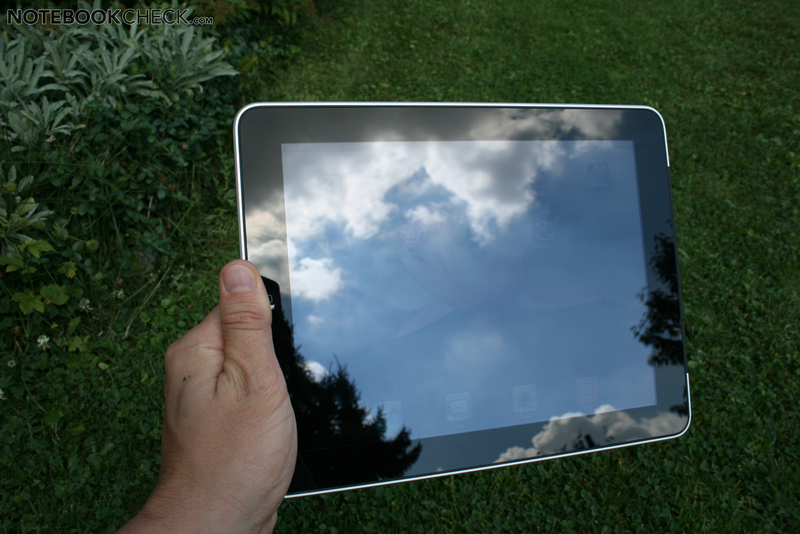 Therefore, the iPad can place itself at the top of all devices we've tested. Merely MSI's Wind U115 (Intel Atom Z520 and the same graphics core in a GMA500) can catch up with a lag of 3-12%. 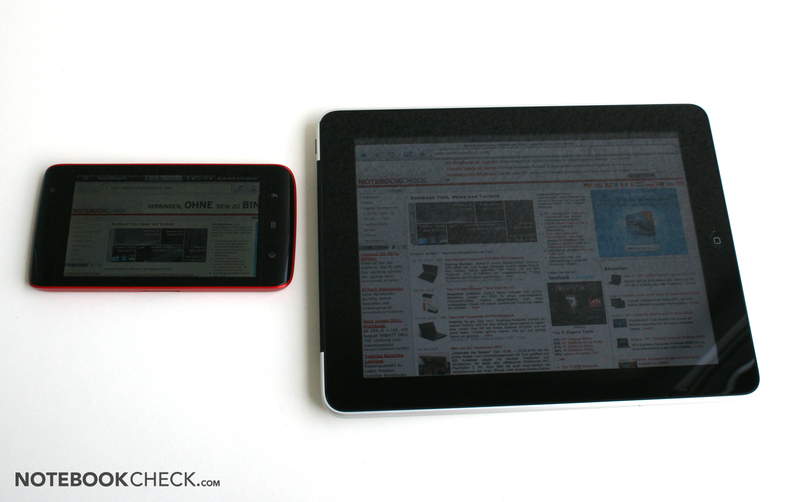 However, it also equipped with a battery twice the size (75Wh vs. 25Wh of the iPad). We needed the included AC adapter for recharging in the test. Too little electricity was transferred via the USB link on a 2007 MBP. You do have to wait for quite some time for the next mobile use with 6 hours and 49 minutes charging time. 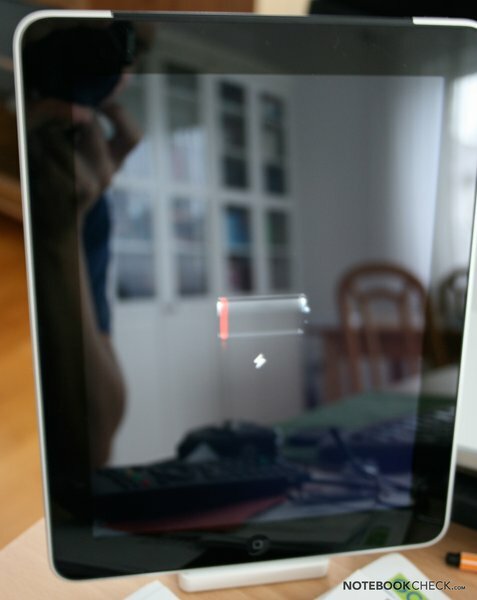 By the way, the iPad can't be turned on at all the first minutes after a complete discharge. It needs a minimally charged battery for this. In any event, you'll have to let a defect battery be replaced (you can't change it yourself). The power consumption is very low due to the economic ARM processor with integrated graphic card. Compared to all notebooks and netbooks in the test, the iPad can take a clear lead in all assessments (in use). Netbooks drain at least 1/3 more out of the socket. The most energy efficient competitors are Asus' Eee PC T91 and Sony's Vaio X11. At most, you could hold the fact that the adapter drains 0.9 watts out of the mains both when the iPad is turned off and in standby against Apple. 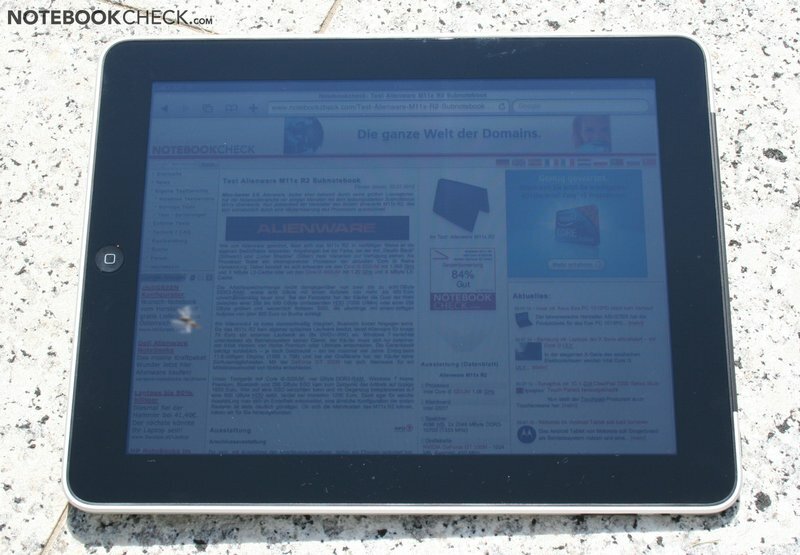 In our several weeks of testing the Apple iPad, we were able to make a detailed picture of the tablet. The installed internet browser, Safari, is of course the center of attention. It's based on the webkit engine and keeps well to web standards. It, for example, reached 100/100 points in the Acid 3 test (however with a small graphical deviation). 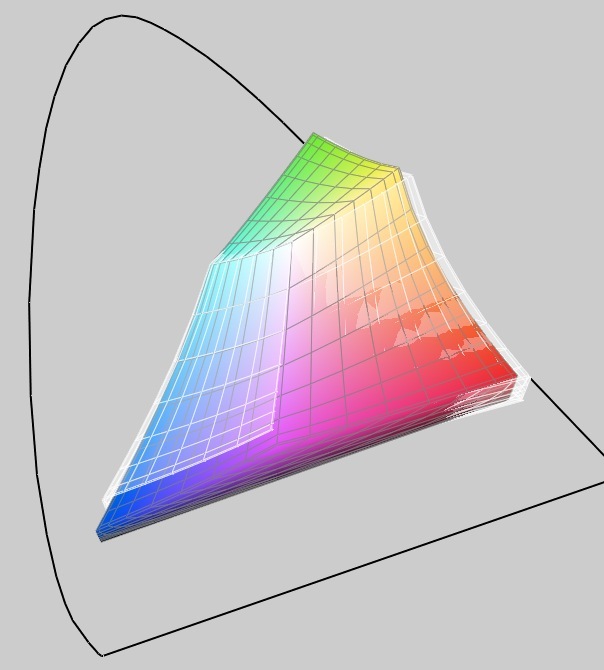 Interestingly, it can't quite render the Acid 2 test completely convincing (see screenshots). The highly responsive user interface is pleasing in daily use (e.g. scrolling is also possible during recharging at all times). Recharging periods aren't disturbing in daily use and surfing is simply fun. Unfortunately, Safari lacks a real tabbed browsing, but retrofitting it with a 3rd party browser based on the same rendering engine, such as Atomic Web (recommendable), is possible. The mobile webkit engine has problems with frame-based sites. For example, Typo3 CMS Backend can hardly be worked with. Regrettably, there aren't any alternative browsers with a different rendering engine available, and due to Apple's Appstore policies, there aren't any in sight. You'll find the only source for additional iPad software in this AppStore - that is if you don't want to free it via jailbreak. There is a vast selection of applications in Apple's store, whereby the majority have only been optimized for the iPhone until now. Good applications are usually subject to charge, though. However, you are very inclined to buy because of the low prices and unproblematic transaction. The Atomic Brower, for example, costs 70 euro-cent. Basically, the application quality in the store is convincing due to Apple's rigid admission policy. We found considerably more unusable Apps in the Android webstore in the test with Dell Streak. Multi-touch use is still even fun after several weeks and entices to take the iPad instead of the (current) laptop for short surf excursions. 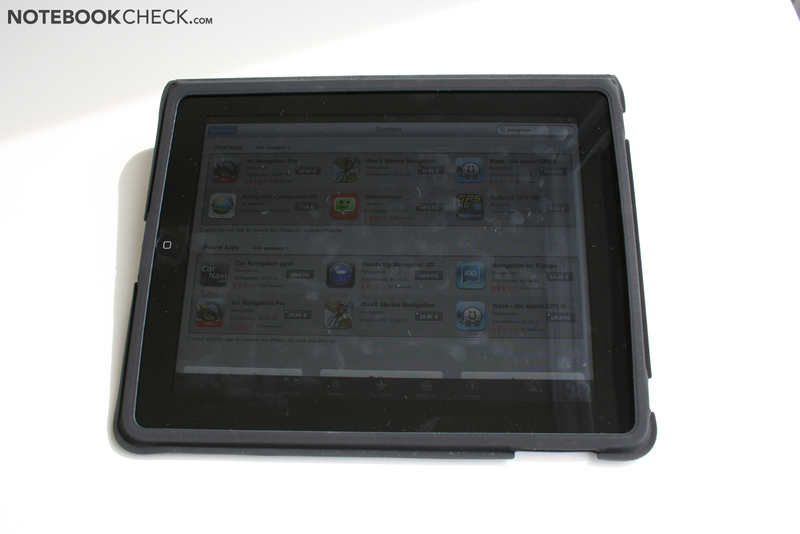 The Apps also use the touchscreen very well most of the time. The virtual keyboard is fully sufficient for small typing jobs, like URLs in browser, forms, short mails. Longer texts can however only be managed fatigue-free with the keyboard dock. It should however be clear that IOS can't hold a candle to any desktop OS in its current condition. Especially, the missing multi-tasking capability is annoying sometimes (e.g. when YouTube videos are preloaded into the YouTube application). Nevertheless, we can understand Apple's argument about intentionally leaving it out. The hardware isn't strong enough yet to always supply a good user experience with multi-tasking. This will improve somewhat with the upcoming IOS 4.2 (October). Couch surfing: It's just simply fun to dedicate yourself to the whole wide world in the web while watching TV in the evenings. Mobile video player: Watching a longer movie in the train or in a plane was a pleasure with the iPad, due to its very good display. The black bars and restricted format rendering are only minor drawbacks, though. The IPod Function for listening to music naturally works perfectly. But it's not really suitable as a MP3 replacement due the Apple tablet's size. 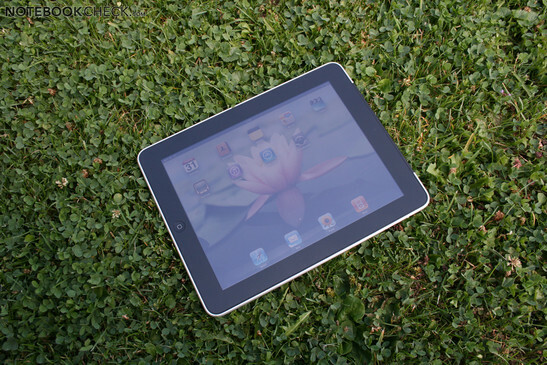 Photo management: The iPad is perfectly suitable for saving, viewing and sorting pictures from the camera with the optional Camera Connection Kit. Even presenting vacation photos / children photos at family gatherings is a great experience (in particular for relatives). 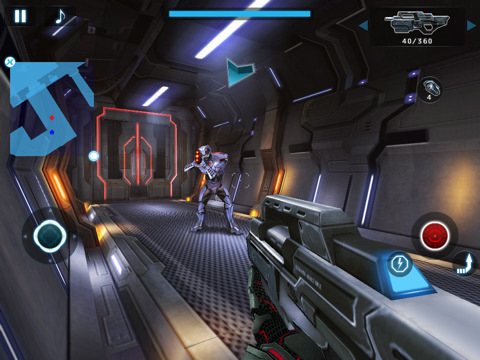 Casual Gaming: The Appstore is full of good, entertaining games that open new possibilities superbly by using the G-sensor, for example. Even sensible children's games can be found by Apple. eBook & eMag Reader: The iPad can be used well as an eBook reader due to its good battery life and large screen. 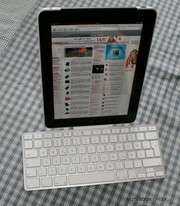 A few magazines also have iPad versions of the printed editions and indicate the possible course. But it's rather more suitable for indoor use because of the reflective display. Outdoor use: As just mentioned, the reflections in very bright surroundings disturb a longer use outdoors to an extent. Nevertheless, the display brightness is sufficient for pastimes in the shade. 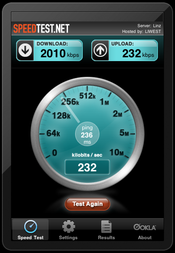 The 3G version was impressive in the practical test with a good reception. Navigation unit: The 3G version we tested had a well functioning GPS sensor (in the test, it usually started with a 10-20m deviation, but after a few minutes it came close to the actual position by a few meters. 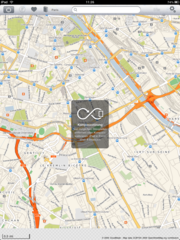 The included Google Maps is suitable for route planning, but doesn't provide a good turn-by-turn navigation. However, there are compatible programs in the Appstore, but you have to reckon with 40-100 euro (depending on the maps). In return, you can navigate offline, as well. 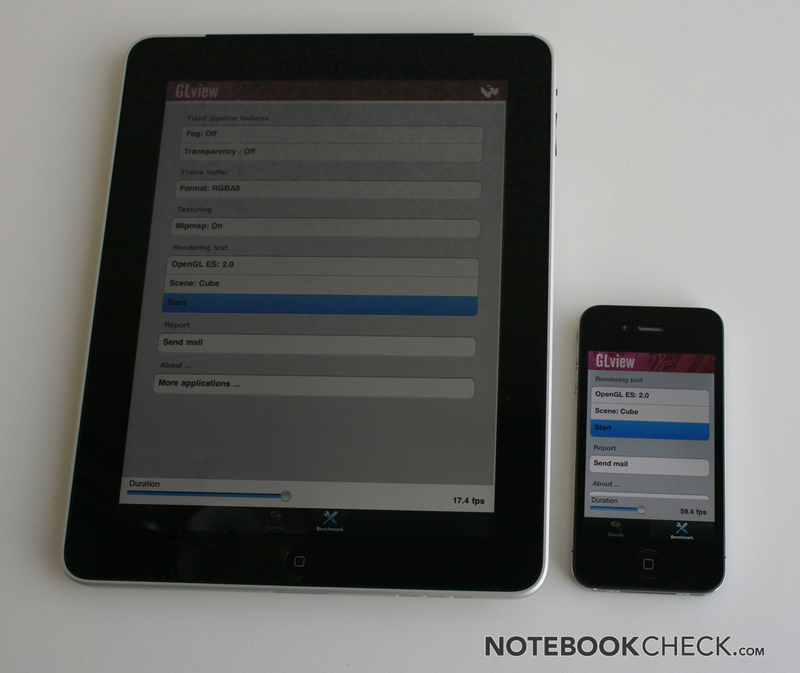 Calendar / contacts / notes: The iPad can also replace the big Filofax. However, a smartphone, ala iPhone, is more recommendable because of the size. Supplementary monitor: With the fee-based application, Air Display, the iPad can be connected to an additional monitor via WLAN (currently only on the Mac). The slow computing speed is sufficient for email, chat windows, or static texts and helps increase productivity. 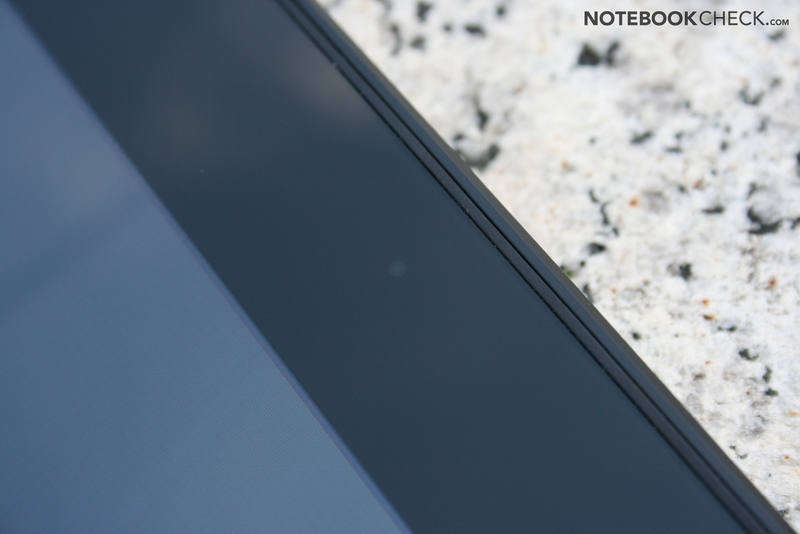 Even the touchscreen is functional and the low power consumption is pleasing. The iPad is fun. It can't and doesn't want to replace a notebook or netbook. And as soon as the small computer is seen as a pure entertainment device, the advantages are obvious. The interactive consumption of multimedia content is the main application field of the iPad. Especially the first magazines and comics in iPad format make you want more. The hardware hardly gives reason for complaint. Particularly the outstanding touchscreen is pleasing at indoor use. 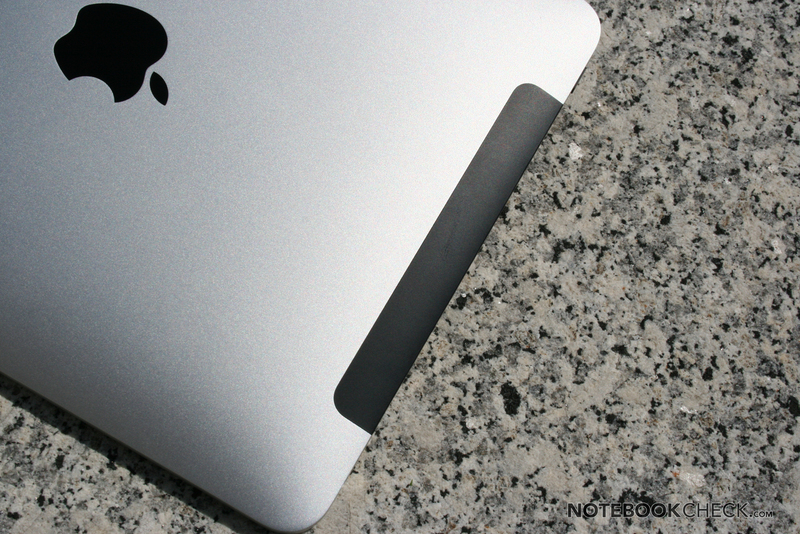 Even the aluminum bottom tray is impressive due to its excellent haptics and stability. 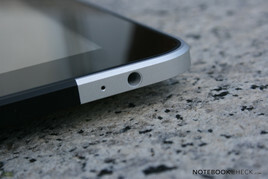 The battery life is well designed for mobile use and the iPad bedazzles with the emissions due to its silent operation. As all mobile Apple devices, the user has to make compromises in terms of wired interfaces. Particularly, an SD cardreader and a USB connection are missing. The optional Camera Connection Kit has both, but it's only restricted to importing pictures. The intense reflections in bright surrounding and the (still) missing multi-tasking should be mentioned as further drawbacks. In our opinion, the lack of flash support isn't a big drawback. Flash is hardly ever well useable in Android 2.2 according to newteevee. 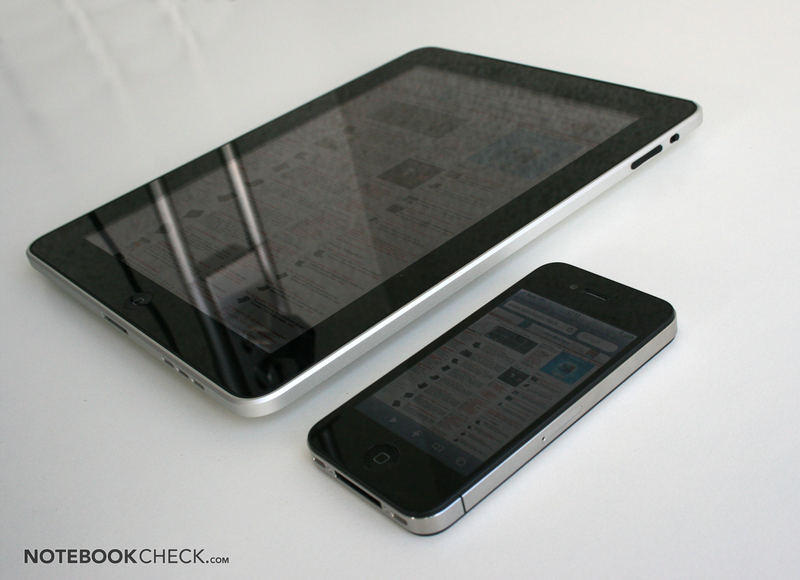 The biggest competitors for the iPad are currently the big smartphones, in particular the new iPhone with retina display. At the moment, the Android camp is also setting heavily on tablets. The Dell Streak (currently being tested by us) is the first tablet of a large player and the Galaxy Tab has just been unveiled at the IFA. Android is to be first perfectly adapted for tables with the version 3.0 next year. 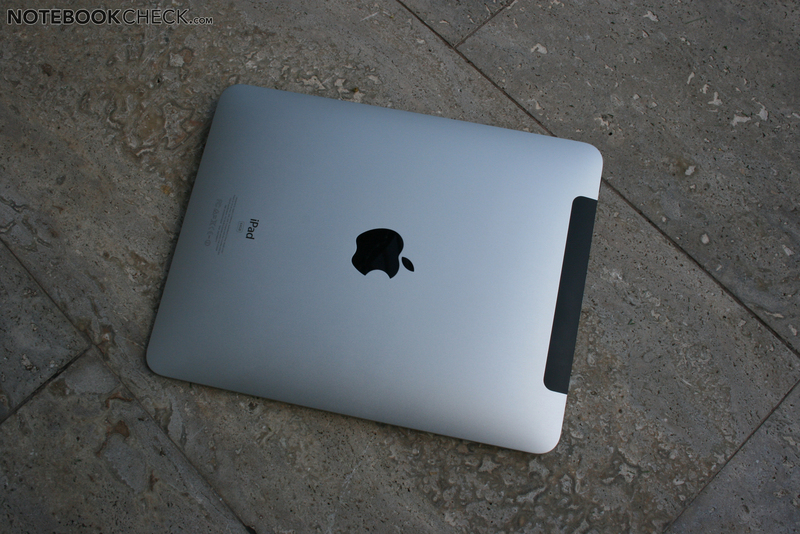 But until then, Apple will have also set higher standards with new operating system updates, and maybe even new iPads. 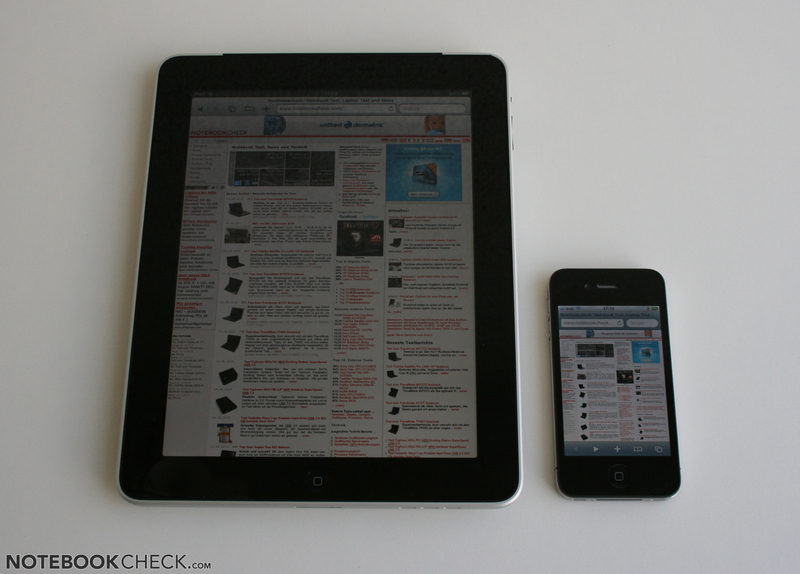 iOS 4.2 for the iPad, to be launched in October, brings amongst other things, multi-tasking, folders, game center, wireless printing and Airplay (wireless music, video and photo streaming). A few functions of a full-fledged operating system. How fast you get hooked on it.